A Bright Corner: A Piece of Cake! 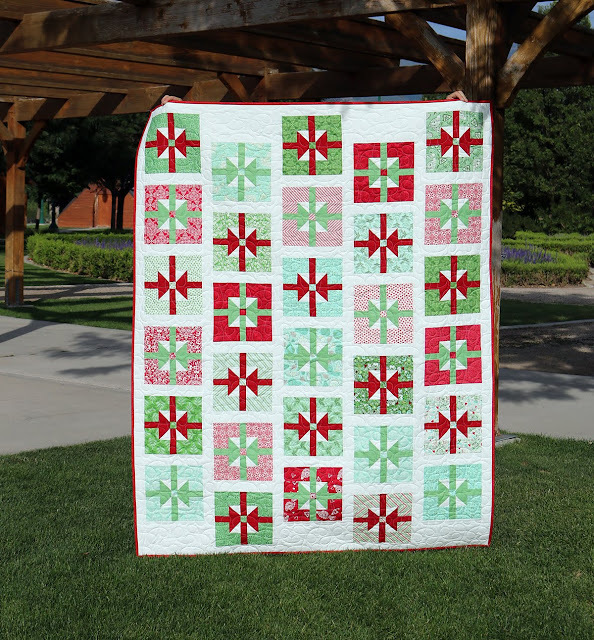 It's really been a summer filled with Christmas quilts! 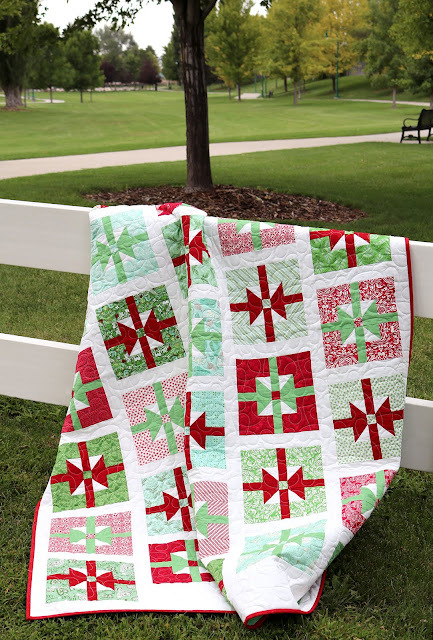 This is the third one I've worked on this month (I'll share the others soon), and I have to say it's a little strange to go out and photograph a Christmas quilt when it's 90+ degrees outside and there's plenty of green grass around! 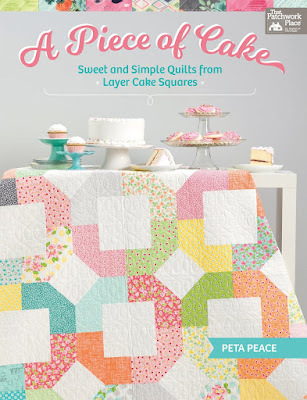 A Piece of Cake - Sweet & Simple Quilts from Layer Cake Squares written by Peta Peace (a.k.a. She Quilts A Lot). The book is filled with great quilt designs, lovely photos, and easy-to-follow instructions and diagrams. When I fall in love with a new fabric line, often I'll buy a layer cake of it. A charm pack isn't quite enough, and I find layer cakes to be more versatile than a jelly roll. But then the layer cake sits there until I figure out what to make. This book will be a great resource - it has so many great quilts, all layer cake friendly! The quilt I chose to make is called Surprise. It finishes at 56" x 71" and I used a layer cake of North Woods designed by Kate Spain. The line came out last summer and I've been holding on to this layer cake since then - looking for the perfect pattern. I love the little presents! 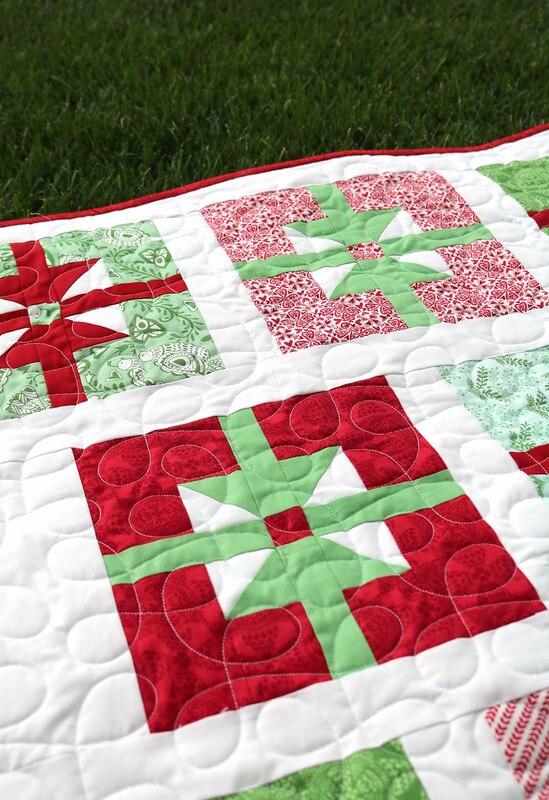 I backed this quilt in a soft mint flannel - it will be perfectly cozy come December! For the quilting I used a longarm panto from Urban Elementz called Cake Walk. You can see more projects from the book by following along on the blog tour. We've already seen three fun quilts from Sedef, Jemima, and Samantha - and there's plenty more to come! 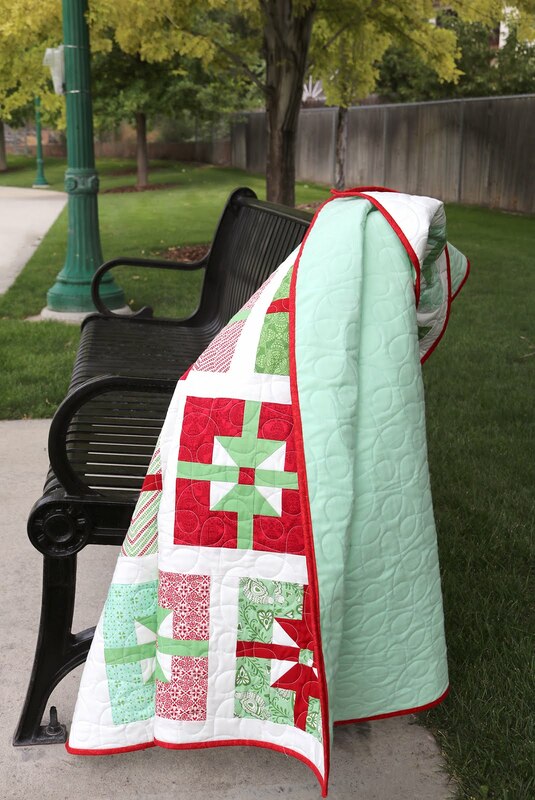 You can also check out some other quilts from the book on Instagram with the hashtag #apieceofcakebook. This is gorgeous! Love that it can be done with just one layer cake. This book is on my wishlist. Love your quilt!! I want this book, it looks so good! Very pretty Quilt!This Book looks so neat>like to own it! Thanks for sharing! I love this sweet quilt! Looks like a great book to own! Your quilt is fun, festive, and fantabulous! It says a lot for what else might be discovered in this book!